Further improvements to c9 permanently storing the results of export efforts. Will store export failure results and result for failure. For Whites orders, system will flag parts that succeeded or failed. In orderbook parts that failed will show as 'Sent(?)' if not yet sent by some other means. Export to other c9 dealer regression bugfix. Was not memorizing selected dealer/franchise on subsequent exports. Now fixed. Bugfix : banks were incorrectly appearing in list of suppliers. Now fixed. Low level bugfix: some timed events would not fire such as alert nags. Now fixed. Some alerts could permanently 'mask' others based on timing. Tweaked timing logic so that every event gets a go. Lead alert nags : nag on either active or parked leads. Any active leads will 'shadow' over parked leads. View/modify job. color code private notes tab if there are any private notes. Added a couple of generic GL Codes. Workshop Job notes. Increased max note size x8. Or about 9 printed pages of text. Select unit. If a unit has notes against it display a notes icon against the unit. Select Estimate. Show estimate reference on all tabs, not just the select by reference tab. Generic Price file import. Support tab delimited files. (e.g. Mcleods .TTX). Tweak decoder to cope with loose quotes but only for tab delimited. (comma,semicolon still strict). Added toggle switch to EPC units to toggle whether or not a unit is to display on the dealers website. Serious bug that has been in c9 since Jan 2018. If price file supercedes part A to B c9 is supposed to delete part A and move qty from A to B. Bug is it doesn't delete and instead moves part qtys from B to A keeping both parts. Now fixed. Backdated unit sale with spare parts. GL posting is dating to today, not the backdate. Now fixed. Book in jobs via a web based tablet. 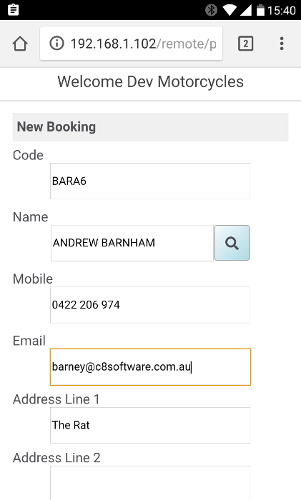 Use a phone or a tablet to capture basic details on a job and merge in the results into c9 workshop. 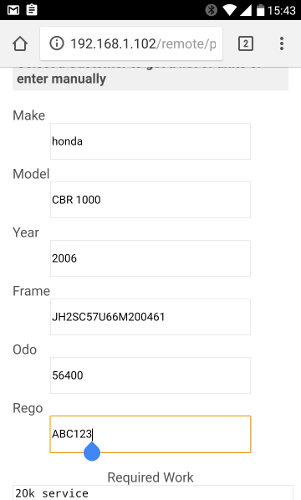 Captured details appear in create new job in c9 ready to merge into a job. 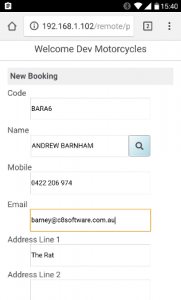 Allows you to merge in details such as change of phone numbers etc after initial service reception. Maybe submit button should only appear in unit screen? Transaction allocation / reconciliation. Normally when you add a payment c9 will automatically 'allocate' that payment against a currently unallocated invoice automatically. This version of c9 allows you to configure certain customers to not do this, so you have to explicitly select actual invoices to link in add transaction (txn list), or modify connected txns in view transactions. This function is potentially useful for manual management of difficult accounts. Rollback unit. UI tweaks to minimise risk of accidental rollback. Screen redesign. Make ok button non default. Pop a nag before doing the rollback. Import invoices from PDF. Some tweaks to better detect / process spaces. Generates improved results for some suppliers, e.g. Sena and Honda SAP. (e.g. with Sena imported descriptions could be bunched up without spaces. 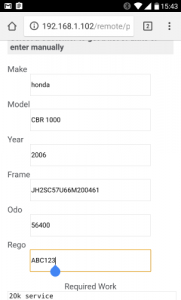 With honda deals with issue of line # of part number blending together). Low level database guards to protect against potential software defects in c9 writing bad values into the database. Needed to support eventual goal of switching c9 account balances and aging towards open invoice. Xero Integration setup. Xero site now requires certificate to be wrapped in a BEGIN/END envelope. Tweaked certificate generator in c9 to include this. Beginnings of some changes to support doing workshop service reception via a web based tablet. This version of c9 acks the submitted tablet data entry but throws the data away doing nothing useful with it. Printing : added smarts to improve linking of reports to customers.